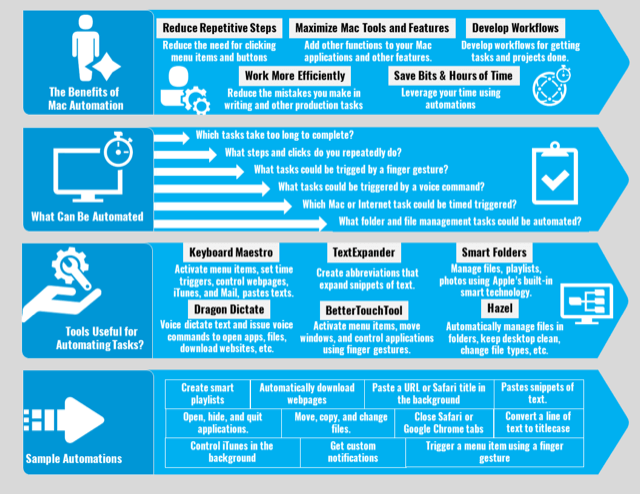 A to-do list is great for managing tasks, but automating your to-do list is better with Keyboard Maestro timed triggers. I use to-do lists not just because they remind me of tasks, but because they also allow me to get reminders out of my head so I don’t have to think about them until they need to get done. 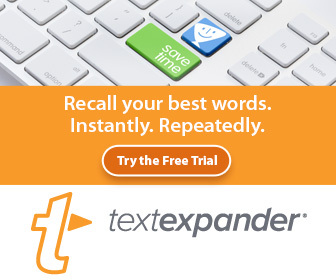 But sometimes, digital reminder applications don’t go far enough. A task management application can issue a notification or alert, but that’s where it stops. Since a lot of the tasks we perform are on our computer, it’s better if we can get more than a notification. That’s where Keyboard Maestro’s Time Triggers come in. The grandaddy of automation programs can trigger timed macros that open designated webpages, files and folders, and launch applications based on specified times and days of the week. Time triggers work in the background, as long is your computer is awake. When you add a new timed trigger to a macro, all the days will be highlighted. You will need to deselect the days you don’t want the trigger to execute. Typically I’m working at my computer by 10:30 a.m., but notice that I added a Display Text action to let me know that the macro will run in 15 seconds. That notice will briefly appear Notifications style, and if I’m already doing something else, I can stop and get ready for the Mint application to open. I have another timed macro that opens either of my two mail applications on different days, as well as an application called Slack. 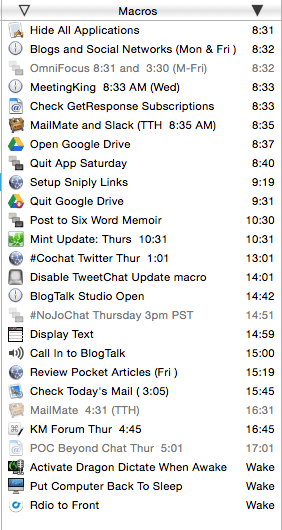 But sometimes I’m too busy to check mail or Slack, or I have already checked them before the macros run. With those timed macros, I added an Alert action that pops up and offers the opportunity to stop or continue the execution of the timed macro. This alert gives me the option to continue or cancel the timed macro. Using this feature is great, but it might be a little confusing. If you leave the Timeout Aborts Macro checked, and you don’t click on either button in the alert, the alert will automatically abort the macro after the default time of 3 minutes. If you uncheck the Timeout Aborts Macro button, the macro by default will run after 3 minutes if you don’t check one of the alert buttons. You can however adjust the timeout behavior by clicking on the Set Action Timeout…button (also inside the cogwheel), which will present a dialogue box for changing the default settings. For my timed macro, I set the alert to abort the macro after 10 seconds, because if I’m working and I don’t want to stop and click the stop button, the whole process will cancel and I can keep focused on what I’m doing. Or I can decide to click the Continue button and deal with checking mail. 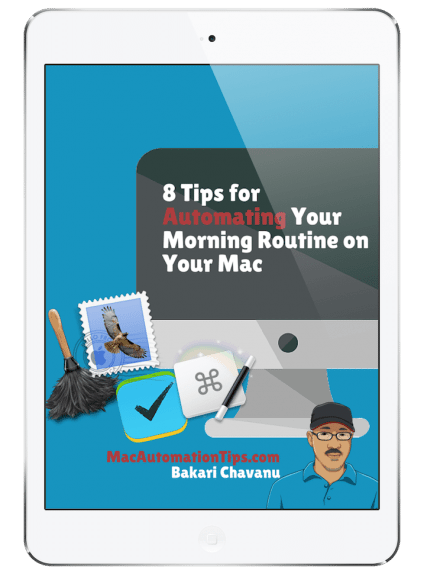 A timed macro can execute most any set of actions, including downloading a designated webpage, opening an application, shutting down your Mac or putting it to sleep, or any other workflow. 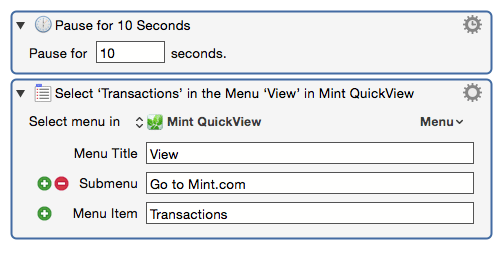 Notice, in the Mint workflow above that I added a few pause actions to give KM time to activate a menu item after the Mint application is launched. That menu action saves me the trouble to clicking yet another button. I put all my timed actions in a group folder so that I can easily locate and adjust them as needed. When I first started using timed macros, I made several adjustments to fit my daily and weekly schedule. 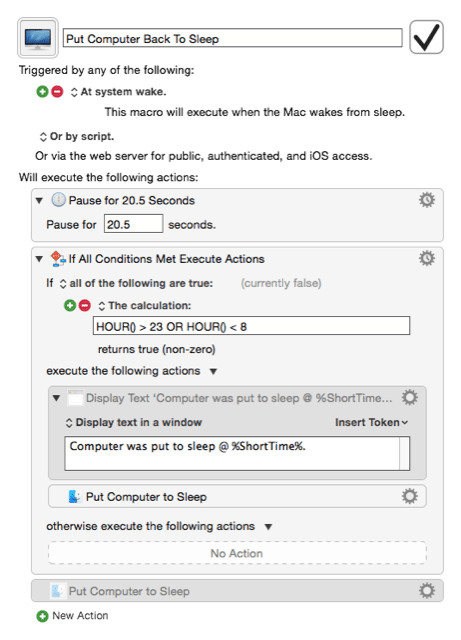 Some actions are set to run right after my computer awakes in the morning, because KM cannot run macros unless the computer is awake. Notice I have a few actions that run as soon as my Mac awakes. For instance, it will activate Dragon Dictate automatically between designated times, because I use that voice command application throughout the day. I have another macro that puts my computer back to sleep if awakes after 11:00 p.m.. 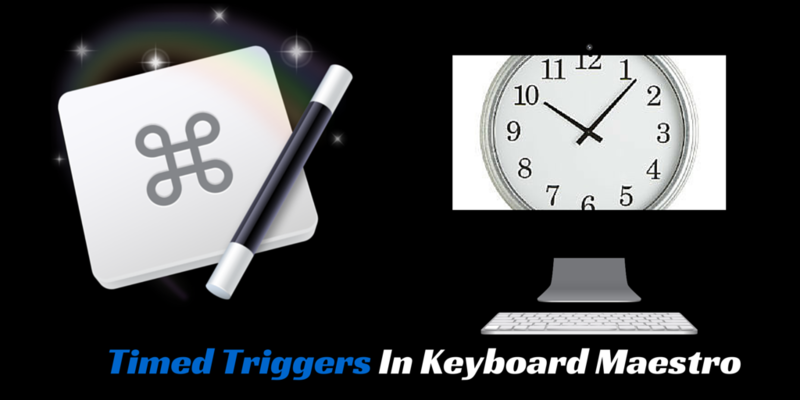 The time trigger is a powerful feature in KM, and it is one of the most easiest and straightforward setups to use. Hopefully in the future updates, there might be a way to set triggers based on designated calendar dates. It would be most helpful if task management applications Calendar could issue timed automations like KM does. Let me know what you think of this KM feature, and how you use it or plan to use it. To launch automation workflows on a calendar date and time, you could set a Calendar (or BusyCal, etc.) 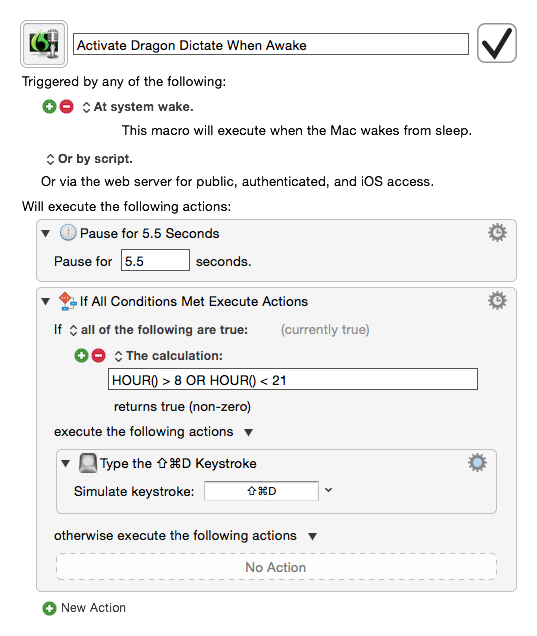 alarm to run a one-line AppleScript that triggers your KM macro. Eurobubba, good point. 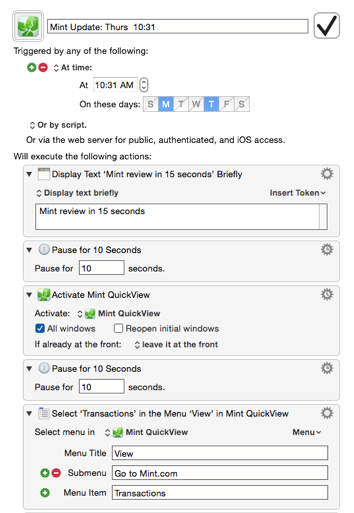 Apple’s Automator used to include the same feature. It would be though faster if the date trigger were built into KM. Maybe I can figure out how to automate the process. Thanks again your tip. One issue for me is I keep getting notifications about macro cancellation… usually just when the laptop had been sleeping. Definitely not necessary info, just noise. I did make a point of turning off “Notify on Failure” but that doesn’t seem to have helped. Hey Russell, link over to the KM forum. The developer of KM is really great about responding to issues inquiries with KM. And thanks for being a reader of this site. How long have you been using KM? Awesome. I need to check that book out. I downloaded it when it was released but yet to get around to reading it. I’m glad he wrote it. 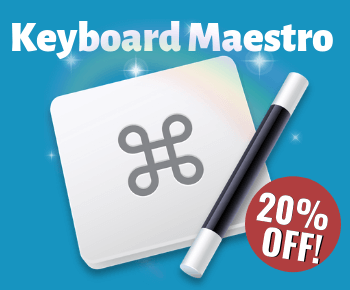 How are you doing with Keyboard Maestro? In what ways are you using it? Outstanding tips and info, thanks for taking the time to share them! Thanks, Bruce, appreciate the feedback. And also congratulations on winning the contests.